While browsing through the September 14, 1916, edition of The Sheridan Advance, I came across this article detailing the misadventure of some local band boys, a Cadillac, and a tuba. The article painted such a vivid picture that, as I read, I couldn’t help but imagine myself at the scene, the mother of one of those good-hearted, reckless band boys. I shook my head, smoothed my imaginary apron, and breathed a sigh of relief that everyone landed unscathed. Well, except for the tuba. I suppose young Robert had some explaining to do about the tuba. Harry Hotaling drove the Hotaling Cadillac automobile in the river just east of Sheridan Friday afternoon. The only damage to the car was a broken front wheel. Besides the driver the occupants of the car were Robert Bell, Ashley Hotaling, and Halbert Kibbe, all band boys. None were hurt. Bell’s large B flat tuba was badly mashed. The boys were driving the pilot car for the booster delegation that was touring the county advertising the tabernacle meeting at Grant City. They were not driving very fast–just about the way the average driver comes along the good roads of Platte bottom, but the driver says he was not attending to business as he should have been. As he came within a few rods of the bridge he noticed a car already crossing. His foot brakes failed him and some of the car decorations were in the way of his levers and he could not get to them. Rather than drive his car into Garfield Calkins, who was on the bridge, he drove over the bank into the river. The bank at this place is at least twenty feet high and steep. Hotaling jumped as the car left the bank. Kibbe and Bell managed to fall into the river and young Hotaling rode the car to the bottom and then deliberately stood up and took a high dive into the soothing waters of Platte. This quieted his nerves some. When the car left the bank it was headed northwest across the river. About half way down the left hind wheel of the car struck the bank and turned the car straight across the river, and this perhaps saved the machine from upsetting. Calkins brought the boys to town immediately and Beezley took teams and men and pulled the car to his shop. A car might make the same flop a thousand times and kill all the occupants each time. The boys were indeed lucky to escape with their lives. Most drivers would prefer a collision. I really don’t know what I love the most about this article. The author spoke with regretful amusement as he told the tale with both patient allowance made for the boys’ sense of high drama, and relief that they were not injured. I also love how the boys freely admitted to all the doofus errors that led to the accident. The failure of the brakes, the decorations in the way of the levers, the TUBA? I can just imagine the atmosphere inside that car. Add four teenaged boys in high spirits, and I’m sure they weren’t ‘attending to business’ at all. I adore the way Harry Hotaling chose to fly off the bank rather than risk smashing up someone else’s car (called an automobile back then–cars were trains). And I love how Ashley Hotaling dove into the Platte after plunging down the bank of the river. Well, why not? Might as well. And I love how Mr. Beezley organized efforts to go pull the Cadillac out of the river, with teams of horses, no less. So much for that Caddy, Mr. Hotaling. But most of all, I love that this story made the front page of The Sheridan Advance, right next to the announcement for the Booster Ladies Meeting and the Rickabaugh and Wilson Colt Show. I think Sheridan, Missouri, sounds like a most excellent small town. I wish I could have visited it back in 1916. There are times during my research into the early 1900s when I am convinced that despite the differences in fashion, people really haven’t changed all that much. Then again, there are times when I cannot believe that we are residing on the same planet, much less in the same country. This morning was one of those times. 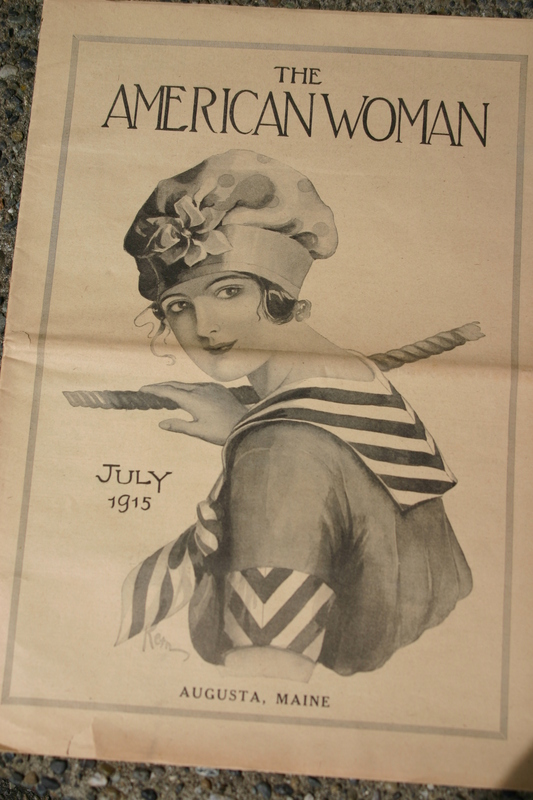 I was browsing through the July 1915 issue of American Woman magazine for a Cadillac advertisement to go along with another article I intended to write. Instead, I became captivated with an ad for Sargol, a pill designed to make people fatter. Hold on a second. People wanted to be fatter? I looked closer. A healthy, robust couple playing in the sand observe an emaciated, pale couple standing several feet away. “Maybe they are time travelers from 2012,” I volunteer. “Emo-Vampires haven’t made it big yet, but this is the look your great-grandchildren will go for!” She ignores me, and I read on. We particularly wish to hear from the excessively thin, those who know the humiliation and embarrassment which only skinny people have to suffer in silence. Thin people were humiliated and embarrassed? I knew I was living in the wrong century! Always the curiosity hound, I googled Sargol, just to see if I could discover the ingredients. But I discovered much more than the mere components of this wonder drug. Volume II of Nostrums and Quackery, presented by the American Medical Association and Arthur Joseph Cramp, M.D., and which is available free of charge through Google eBook, details the trial of the makers of Sargol. Shockingly enough, Sargol doesn’t work! According to Nostrums and Quackery, Sargol was created by Wylie B. Jones and Oliver C. Kingsley in Binghamton, New York in 1908. In 1912 Herbert B. Woodward replaced Mr. Kingsley in the business. They advertised that Sargol would put weight on people, no matter what the underlying cause of the weight loss. People suffering from tuberculosis, diabetes, abdominal tumors and much more were all assured that Sargol would return to them the healthy pounds stolen by their various diseases. They were investigated, and after a thirteen week trial, they were found guilty of fraud and fined $30,000, which was paid in February of 1917. During the time they produced Sargol, it was estimated that they defrauded their victims out of $3,000,000. So what, exactly, did Sargol contain? Turns out, it was mostly Extract Saw Palmetto. The fashions may change, but the relationship never will. 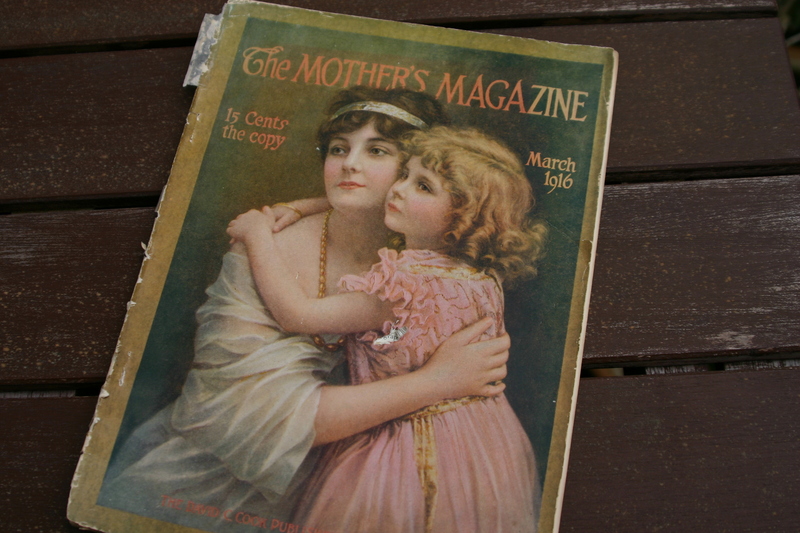 I saved this magazine especially for my Mother’s Day post, expecting to find amusing anecdotes highlighting the differences between how we mother today and how our great-grandmothers mothered a century ago. But curiously, blessedly, I couldn’t find much. When it comes to mothering our babies, not a lot has changed. Oh, methods have changed. Medical care has changed. Nutrition has certainly changed. But, looking at the bigger picture, it seems that mothers pretty much want the same things for their children no matter on what year the fluttering calendar pages have come to rest. I think we can agree that magazines speak to the social concerns and aspirations of the day. Even if the individual reader finds herself unable to live up to those aspirations (like I fail to live up to the standards of Martha Stewart Living), we can still learn what a good portion of the population was aiming for by reading the magazines of the time. And going by this magazine, I’ve realized that our sisters of the early 1900s were a lively, opinionated, caring group of mothers, who put their efforts in to raising their children and running their households to the best of their ability. Is that any different than what I do? Just like any present-day parenting magazine, the March 1916 issue of The Mother’s Magazine contains articles ranging from broad social concerns to problems that crop up closer to home. Our 1916 mothers read articles on improving the school system and the National Baby Week movement, which aimed to educate parents across the country toward more healthful infant care,ultimately reducing the yearly number of infant fatalities. They also read about more personal concerns, such as coping with interfering mothers-in law, reducing the work load around the house, baby’s hygiene and nutrition, care of a sick child, and the best general parenting methods. They found new recipes to try (a whole article on ways to prepare bacon! ), articles on the current fashions, and many, many advertisements–all selling ways to bring up a superior child, improve their looks, boost their health, and make a little money on the side. Sounds awfully familiar, doesn’t it? The child’s character in future years will reflect just as much sunshine and cheer as surrounded him from the earliest days. We recognize unthinkingly that the child is a reflection of his surroundings. The whining child lives with irritable people. The rude child is not treated courteously. We recognize the beloved child at once. Whatever of strength or weakness may be hidden in the child’s heart his manners and mannerisms, the habits that will make him attractive or the reverse, are the reflections of his surroundings. No child speaks a harsh word until he has heard one. No child lies, in the essential meaning of the term, if he is brought up in an atmosphere of kindness. And the beginning of this silent training is in the very beginning of his life. Love and truth must wrap the cradle. Firmness and self-control must be the mother’s while the babe yet sleeps in her arms. When baby was tiresome or unmanageable he was my child; when he was cunning or unusually handsome, he was “John’s baby” or “my grandchild.” I came to discover that my mother-in-law’s devotion to our baby was purely selfish. She did for it what gave her personal gratification, and skipped nimbly out of the way of any of the hard, disagreeable tasks connected with his care. It wasn’t that I wanted her to do them; it was only that the sentimentality without real service finally got on my nerves. Of course there were some things here and there that gave me pause. From the aforementioned bacon article, I give you a recipe for–wait for it–Calf’s Head with Bacon. They say bacon makes any dish good, but I’ll let you be the judge of that. Take half a calf’s head, remove the brain carefully, wash it in cold water, and put it in a basin of water with a little vinegar. Wash the calf’s head in salted water, then boil it in seasoned water or stock and cook till tender, together with a piece of lean bacon. Take up the head, drain, and serve with slices of boiled bacon. Serve with brain sauce. Are you now wondering how to make ‘brain sauce’? Keep reading! Drain the brain mentioned in the foregoing recipe, remove the skin, and put it in a saucepan with enough water to cover, adding one-fourth teaspoonful of salt. Boil up quickly and place in cold water, then drain again and chop it finely. Now add the chopped brain to one cupful of white sauce. Season to taste and serve. Hmmmm… I think I’ll save that recipe for Father’s Day! Happy Mother’s Day, everyone. Perhaps it is because I’m new at this, but I’m beginning to look longingly forward to the day I finish this book and move on to my next novel. It isn’t because I’m growing tired of my topic, or that I’m weary of my protagonist. Far from it. I love my little story and all its flawed inhabitants. But you see, they live in 1915, and no matter how much research I think I’ve done, and I’ve done quite a bit, I still find myself stumped by the simplest of things. It would be so lovely to be able to just write without worrying about How Things Were Done in the Early 1900s. Last week “Mama” was in her kitchen, slicing tomatoes, and I got to wondering… what did she slice them on? 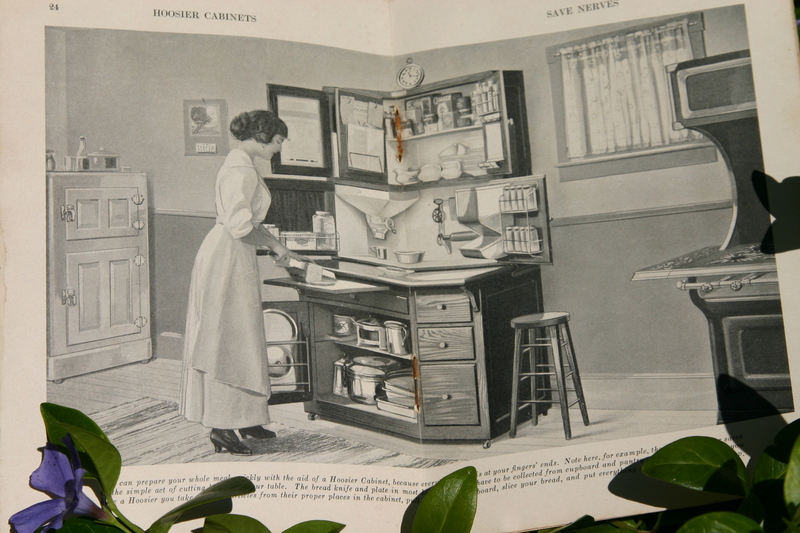 I’ve done enough research to know that most people in 1915 did not have built-in cabinets with counter-tops. I know they had a big, black cookstove and an ice box (cooled with actual ice). I know they kept fresh meat in a “cold room” in the winter and that the location of the egg case varied depending on the time of year. But, what did they do their basic food preparation on? And how could I have failed to stumble across this during all of my research? Another frustrating interruption to the flow of my writing yet again turned into a worthwhile detour. I may never get my first draft done, but I’m sure having fun on the journey! 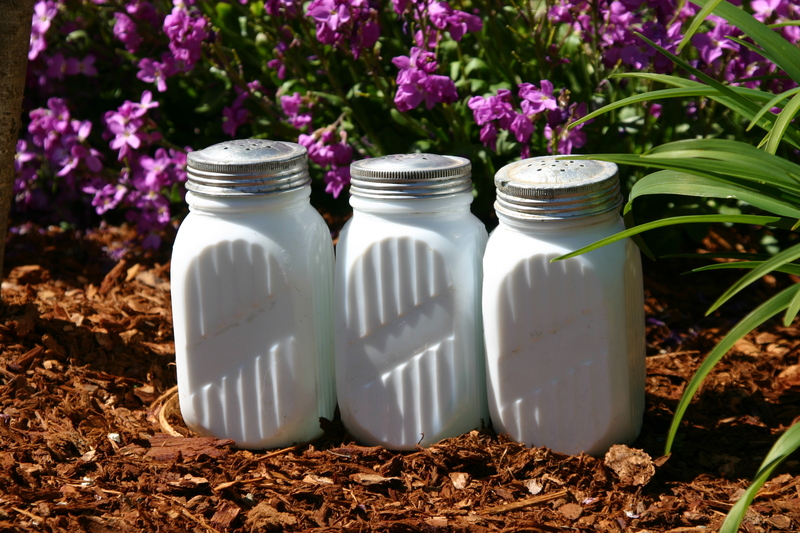 Here is what our pre-countertop sisters used for food preparation, and darn it–I want one for my kitchen! The purpose of the Hoosier Cabinet was to reduce the number of steps a housewife took during the day, thus saving her strength. And when you think of all the things those ladies had to accomplish on any given day, you can see the attraction. Doing the laundry involved heating water on the stove, scrubbing clothing on a washboard, laboriously wringing them out, and hanging them up to dry. Ironing was an actual heavy iron heating on the cookstove. Making lunch meant killing a chicken, plucking the feathers, cutting it up and preparing it to fry. Then there was the vegetable garden, baking, childcare, and often farm work, as well. You can see the attraction of any kitchen device that would save a woman’s time and energy. I have no piece of furniture in my well equipped home that helps as much to make the housework easy as my Hoosier Cabinet. My baking days are enjoyed instead of dreaded. Everything is at hand ready for use and it is a pleasure and satisfaction to use them. The Hoosier cabinet really was a marvel of organization, sort of the iPhone of the era. The inside of the upper-left cabinet door contained a clock-style shopping list. When an ingredient was needed, you pointed one of several arrows at it as a reminder on shopping day. A swing-out cookbook holder kept recipes at eye level and out-of-the-way of spills. Flavorings and extracts had a special rack on the inside of the upper-right cabinet door, while spices were placed in specially made jars that fit in their own rack on the lower right door. A built-in flour sifter is on the left, and, next to the rolling-pin rack is a built-in sugar bin. Tea, salt, and coffee are neatly contained in the mid-height door on the left, and a slide-out aluminum work surface meant that the baker could sit down comfortably on a stool to mix her cakes. Just underneath that (and shown in the picture) a cutting board could be pulled out to slice bread or anything else. A drawer underneath the cutting board contained eating utensils and had a special compartment for string. The upper-right drawer (beneath the work surface) was for tea towels, the drawer under that was a metal lined grain bin. The lowest drawer was lined with ventilated metal (and a heat-resistant asbestos bottom) providing mouse-proof cake and bread storage. At the very bottom, space was provided for pots and pans. All of this ensured that nearly all of a housewife’s daily cooking tools were contained in one handy location. Recently, I decided to re-organize my kitchen. I rather publicly predicted that I could get it done in two hours. But two days later I was still up to my elbows in various kitchen machinery–mixers, blenders, food processors. I think our great-grandmothers had it right. Create a workspace with everything you need in reach and keep it simple. I was so charmed by the Hoosier Cabinet, that I found and purchased some antique spice jars that supposedly came from one. While I would love to have a Hoosier of my own, I cannot think of a single place I could put it. All those darn counter-tops! What do you think? Did we lose a good thing when built-in cabinets came into fashion? I Want a Pony, Too! Okay, I admit it. I was always jealous of my grandma’s childhood. 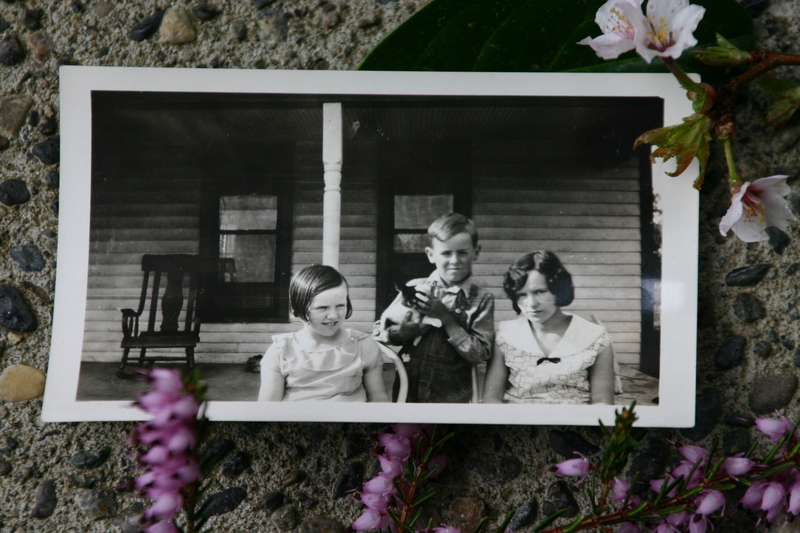 I grew up entranced with her stories of life on a farm in the early 1900’s. And while I grudgingly acknowledged that it couldn’t have been easy, Grandma never highlighted the hardships of living on a farm with no running water or electricity. Possibly she knew that I didn’t really care about any of that. All I wanted to hear about were her adventures with Babe, the ex-racehorse she rode to school each day. I’m sure it was when she first told me about Babe that I realized there was no justice in the world. For I would have gladly and instantly traded all the unappreciated conveniences of modern life to have a Babe of my own. When I finally grew up and bought my own “off-the-track thoroughbred,” my grandma was the first person I wanted to tell. Sadly, I don’t even remember her reaction to the news, though I’m sure she was probably cautiously pleased. All I remember is how badly I wanted to share the excitement with her. That was all many years ago, and I thought I was over that childish jealousy. I might not have grown up surrounded by farm animals, but I also grew up without polio or outhouses. It all works out. 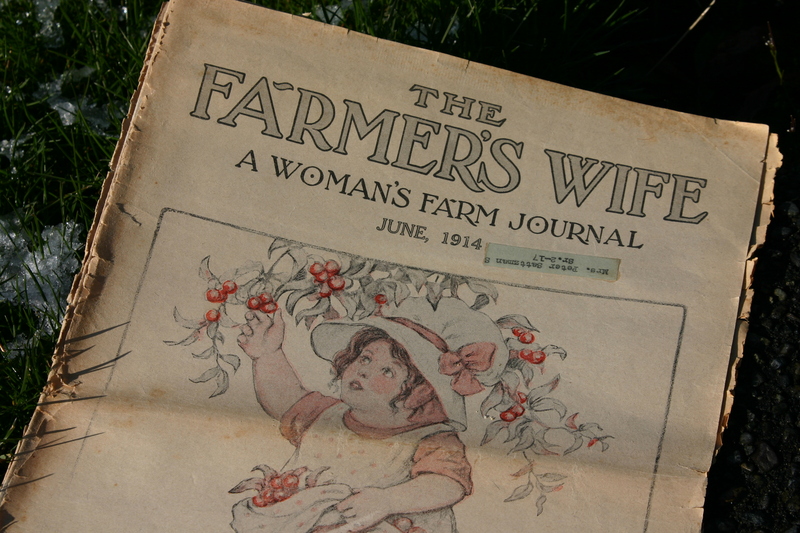 But a couple of months ago, while doing research for the novel I am writing (which was inspired by my grandma’s stories) I came across an article in The Farmer’s Wife magazine pictured above. It was entitled “Our Pony Club,” and their stated motto said “A Pony for Every Boy and Girl.” Although the details aren’t clearly laid out in the article, it appears that if you sold a certain number of subscriptions to The Farmer’s Wife, they would send you a FREE PONY! Well, here comes the jealousy again. I’m 42 years old, and I can tell you right now that had I been presented with that offer at any moment in my childhood, none of you would have been safe from my solicitations. Girl Scout cookie sellers would have been rubble under my feet in my quest to get my free Shetland pony. Perhaps it was better that I wasn’t around back then. Dear Pony Club: Bless your dear life for sending me the dear little pony “Winkle.” It is the sweetest, cutest little thing I ever saw and I am so happy. The mail man brought him from the station and arrived Thursday evening. I tell you there was some joy around the post office. Many of my little friends were here to help me greet “Winkle.” Many thanks to the good people that subscribed for your nice paper. I’ll send my picture with “Winkle” soon. With all good wishes to you. I am your little friend, Myrtle Pearl Holbrook, Wilkes Co., N. Car. A picture was printed–proof that a free pony was just within your reach. 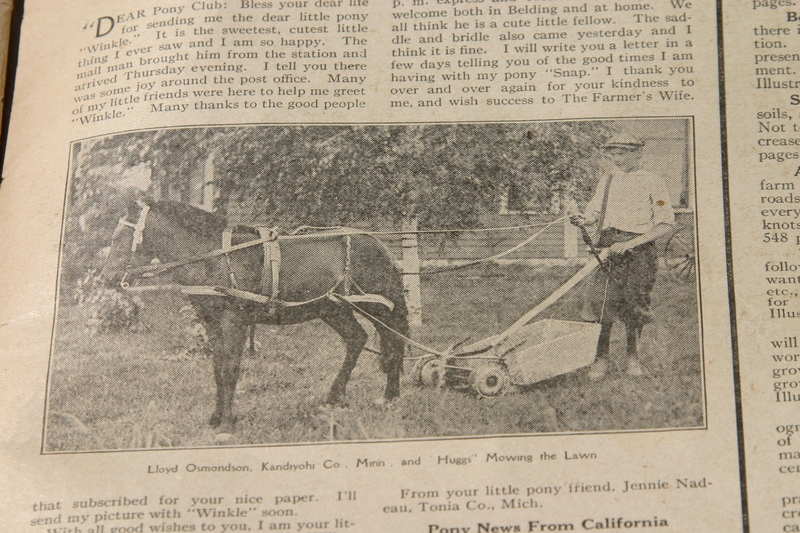 Here is little Lloyd, mowing the lawn with his pony, Huggs. How cool is that? You can mow the lawn AND fertilize it at the same time! My pony “Snap” arrived yesterday, the 10th on the 6:53 p.m. express and received a very hearty welcome both in Belding and at home. We all think he is a cute little fellow. The saddle and bridle also came yesterday and I think it is fine. I will write you a letter in a few days telling you of the good times I am having with my pony “Snap.” I thank you over and over again for your kindness to me, and wish success to The Farmer’s Wife. From your little pony friend, Jennie Hadeau, Tonia Co., Mich.
Huh. So apparently they were getting free tack with their ponies, too. Ah well. I’ll get over this someday. As always, thanks for reading. I am a novice researcher. I make no secret of that. In writing my historical fiction book, I have chased entire flocks of wild geese, wasted shocking amounts of time, and developed a strange affinity for all those hamsters spinning furiously away on their little wheels, going nowhere. Still, when I look back over what I’ve accomplished, I am humbly amazed. I never thought I’d get as far as I have. At what point does casual interest turn into obsession? When does clicking through Wikipedia suddenly morph into ordering microfiche of 100-year-old newspapers from historical societies? When do you move from yawning over Google to booking airline tickets and cold-calling local experts? The moment I realized that the fading black-and-white photographs were concealing things from me was a revelation. My grandma, Elsie Davidson Carr, on the far right. I was looking through a book about Sheridan, Missouri when it happened. The centennial year of 1987 was a big deal for the local residents of the small town where my grandma spent many of her childhood years. I know it was a big deal because I was there. But I try not to remember, because in 1987 I was a snotty highschool senior who couldn’t believe she had to spend part of her summer vacation in a tiny little town in the midwest. I could not have been less interested in the place where some twenty-three years later I would locate the main character of my book. Thankfully, the Sheridan Centennial Book Committee put together a bound copy of the town’s history. And it was while I was poking through it that I discovered photographs have secrets. When I look at the pictures of my grandmother as a young lady, I am always struck by two things: how beautiful she was and how serious she looked. 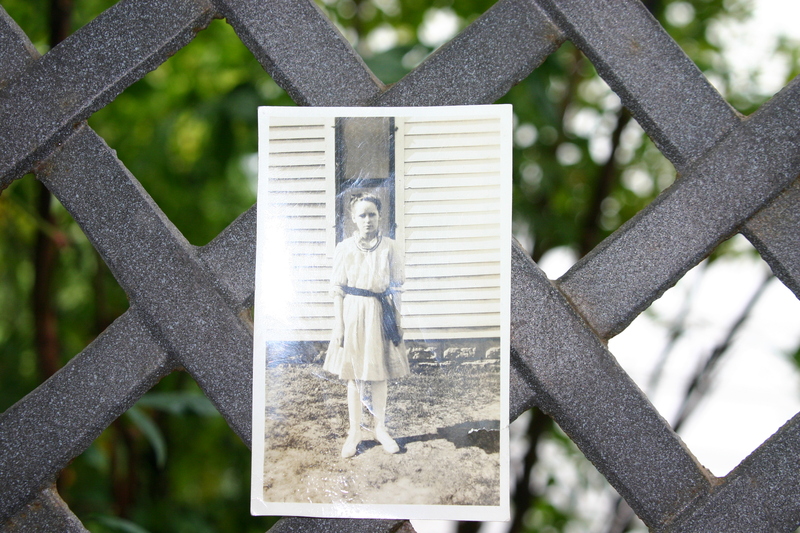 Since my grandma was one of the happiest, funniest, most sharply witted people I know, it was hard to connect her with the serious, dark-eyed girl in the photographs. I always figured that times were tough back then, that people were not as happy as we are today. A memory from my childhood floats back to me. For me, smiling was much more natural. The idea that a sense of humor was a modern invention sprung up so quietly that I never even noticed it. This notion was challenged early on in my research. In the Sheridan Centennial book, I read about a bank robbery that occurred in town in 1898. The advance agents of prosperity opened a bank at Sheridan, this county, Monday night, but unfortunately they opened it with dynamite and a crowbar. What? Were they being funny? Their bank was robbed, and they were making a joke of it? Turns out, the bank robbers got away with well over $2,000. Back in the 1890’s, I’m sure that represented the life savings of the bank robber’s victims. But here they were, reporting the calamitous event with a wry sense of humor. And something else, too–grace. I immediately ordered several years worth of the Sheridan Advance newspaper via inter-library loan. I discovered a couple of things: microfiche technology has not changed a bit since I last used it to research a science project in middle school, and while the photographs taken in the early 1900s show a serious crowd, their newspaper articles reflect a different sort of attitude entirely. …ate so much that we decided to give them a little joy ride to relieve the gas pains. We loaded them in Harley Dowis’ Maytag and he started with them for a spin. Now it takes some car to pull three men loaded to their capacity and the Maytag, ordinarily a good puller, could not stand the strain and died with a snort two miles from town. It took three Fords to get them back home. I began to realize that my grandma’s sense of humor did not suddenly materialize in the 70’s. Reading on, I saw that the people of Sheridan had a flair for humor even with a simple request for volunteers. Since the ladies of Sheridan are going to meet at the Diamond Theater Tuesday night to discuss plans for raising money to build a band stand, we would like to see them perfect an organization called a Ladies Civic Improvement Club at this time. An organization of this sort can accomplish things that the men couldn’t if they would, and wouldn’t if they could. For angels walk where mere man fears to crawl. When you get through killing that quart or quarts as the case might be, pile them up in a nice little pile where the small boy can find them. It’s quiet (sic) a chore to run all over town hunting bottles to get the price of a movie ticket. And above all, don’t break them in weeds any more than in the street. They puncture heels as well as tires. So where does interest meet obsession? In the personality of the people. As always, thank you for reading. The inspiration for my protagonist and so much more, Elsie Davidson Carr. Over the last two years I have spent many hours picking through my tattered collection of newspapers and magazines of the early 1900s searching for insight into the lives, the habits, the thinking of the people of those times. As I flip through those old magazines, characters of the era seem to rise out of the pages and speak to me. Apparently, they all want to be in my book. Sadly, like big-eyed puppies at the pound, I must turn most of them away or else completely redo the plot and premise of my book. I think any writer doing research for a work of historical fiction must, every now and then, fall prey to these ‘imagination flares’ as I call them. The trick is knowing when to include them and when to regretfully, sorrowfully turn them away. Miss Florence Morton (b. 1881) is one of those intriguing characters. 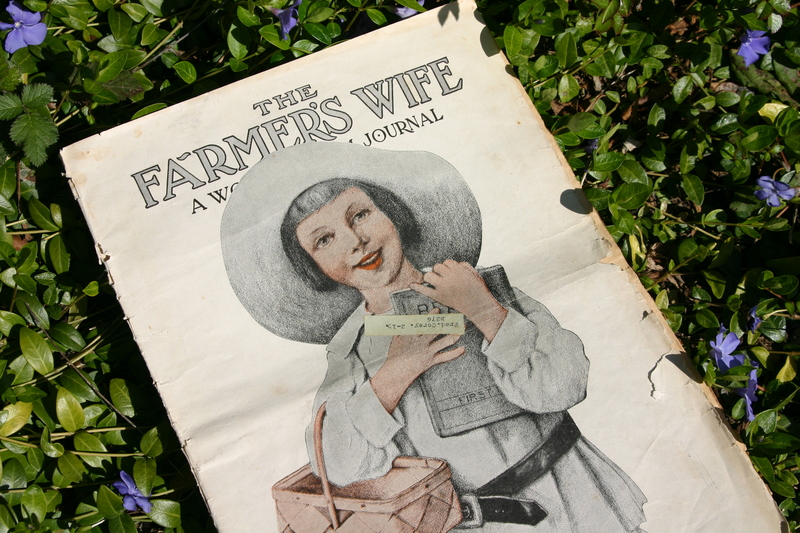 I discovered her lurking in a June, 1914 issue of The Farmer’s Wife, purchased on Ebay (of course). For weeks after reading John Scott Mills’s article about Miss Morton, I tried to think of some way to include her in my book, but alas, her character was simply too strong to take a supporting role. You see, Miss Morton is a leading lady. And lest the feminists of today (myself included) begin to think that we own the movement, let me just tell you what a single lady in 1914 accomplished before she turned 33 years old. Florence grew up on a farm in Oregon. At the tender age of eight years old, she was sent away to school. Upon turning 16, she became a teacher. Apparently, two years of teaching obstreperous youngsters was enough for her, and she left that profession and trained to become a nurse. She then spent several years working in Portland, and in her free time she frequented local race tracks. She eventually bought a Yakima-bred filly, hired a trainer, and began racing. The article doesn’t say how Miss Morton came to the decision to dive into the racing industry. It seems to me like a long step in a dark room for a single nurse from Portland to decide to become a racehorse owner, but Florence jumped right in. Her little mare eventually earned her $3,000.00. In 1910, Florence’s father passed away and left her 120 acres of land. Florence used her track winnings to purchase an additional 100 acres, and just like that, she was a farm owner–all by herself. At the time she purchased her land, only 25 acres were cleared. By 1914, she had 40 acres cultivated for a commercial apple orchard and oats and barley to feed her stock and poultry. She also grew three tons of corn, plus a vegetable garden and fruit. She produced and sold apple cider and jellies and preserves from strawberries, cherries, currants, gooseberries and blackberries. She began selling eggs – each one date stamped with the day it was gathered to ensure freshness for her customers. Florence also ran the dairy, milking the cows, running the separator, and churning butter three times weekly. She then delivered the butter to her customers. Miss Morton also began breeding and showing prize hogs and Jersey cattle. This got her name in the papers and benefitted her farm by increasing traffic to her business. Wearing short “khaki bloomers and a shirt of the same material,” with “high laced shoes over black stockings,” Miss Morton did most of the farm work herself. In a day where the only short dresses were seen on little girls, and women’s hemlines were at the ankle, one wonders what sort of feedback Miss Morton had to endure. Any woman who has ability and the faculty of management can run a farm. She must not be lazy or too fond of her bed. She must like her work and look after it. They are simple words, but oh so meaningful. 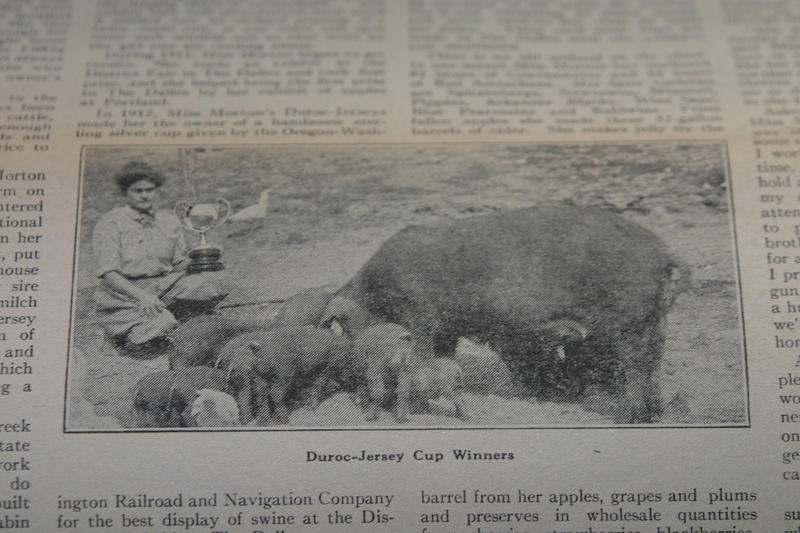 Florence Morton and her prize hogs.